Buy Fort Boards® fort building kits and start building! 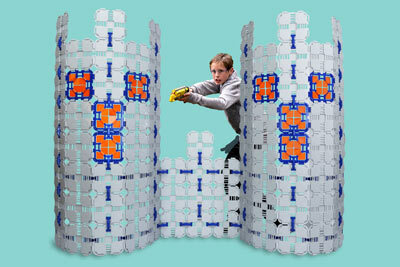 These forts for kids create practically anything. Cars, playhouses, castles, sea creatures and much more! ORDER BELOW FOR FREE SHIPPING! You may still get Fort Boards before Christmas if you order here. Need a guaranteed delivery date? Order on Amazon.com. Your kids (ages 5 & up) will build their own entertainment with Fort Boards. It can build a huge variety of forts, all big enough to crawl inside. At the end of the day, all of the parts stack together for compact storage. Safe for all ages, durable, and fun; your kids are going to love building with Fort Boards. 44 Boards (8 inches x 8 inches), 46 Connectors. 20 square feet of surface area can be built many different forts up to 5 feet wide. We bought these guys our 7 yr old and 1 yr old for Christmas. One of the best toys we have ever purchased. Yes they are pricey, but we see it as more of an investment in their creativity and imagination. They'll be using these a long time. They are played with on a daily basis. They are fairly sturdy and easy to snap together. The only issue we have with assembly is attaching corner pieces on a roof, I have to help with those, but otherwise my 7 yr old has no problem with assembly. And since they are plastic, they can play both indoors and outdoors with them. If it rains or snows and they accidentally get left out, it won't hurt them. They're favorite thing is to make a fort with one side open, park their mini couch inside, and sit and watch a movie together like they're at a drive in. You do need multiple kits to build forts. But for me, it's well worth it when I see the creativity and imagination bursting out of my children. That's priceless. My 2 and 4 year olds love to help build and create fun places to play in with these. clean up pretty easily and can be stored in original packaging. it's also awesome you can purchase the different kits for more options. Grandson likes to build things with this. My grandsons have had hours of play and never tire of it. It takes up space, but well worth it! We got these for our kids for Christmas, they are a really cool toy but also fairly pricey. We would have bought more if more reasonably priced. Our 2.5 and 5.5 year old boys really enjoy building different forts with these! We also have different cards for changing the appearance of the fort (todays is a castle). We look forward to watching/helping them build various structures and enjoy playing in them! I wish we had instructions for all the varioius forts that they show on the site that our kit can make! Ours only came with the "house" instructions. I bought this for my three year old niece because she can build inside and outside and easily take it apart. She loves playing with the fort boards and I will likely buy more for her birthday so she can build even bigger structures. I had to buy my grandkids another set!! He loves building forts with this keep in touch. The pieces easily go together. They are also very sturdy so it will not break easily. I recommend to all kids who love to build.